'Health Club of the Year' Frame Awards 2019. Jury and People's vote. The client’s program included a gym floor, juice bar, cycling studio and circuit training factory all in a limited space of 600 sq m. Working with an irregular plan of 3 separate retail spaces, VSHD Design inserted a semitransparent cube in the center of the space to host the different functions. 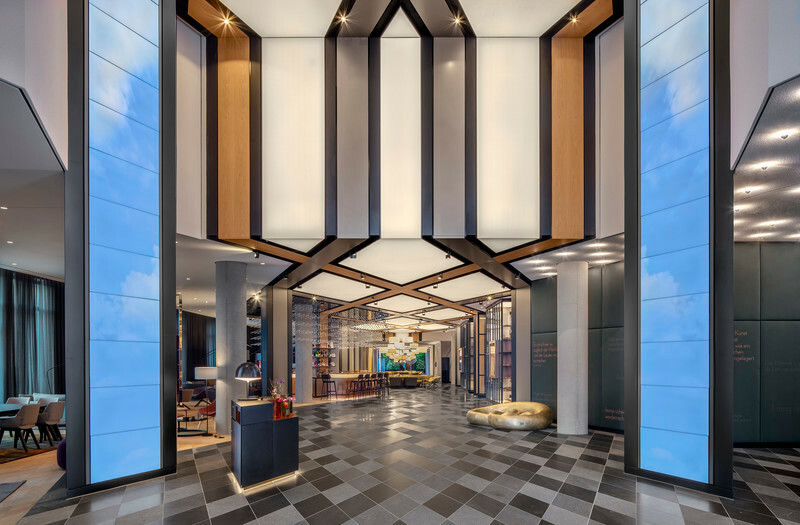 The architects' main challenge was to deliver a boutique fitness facility that is inviting, inspiring, authentic, functional and in context with a leading destination for design, art, and culture. 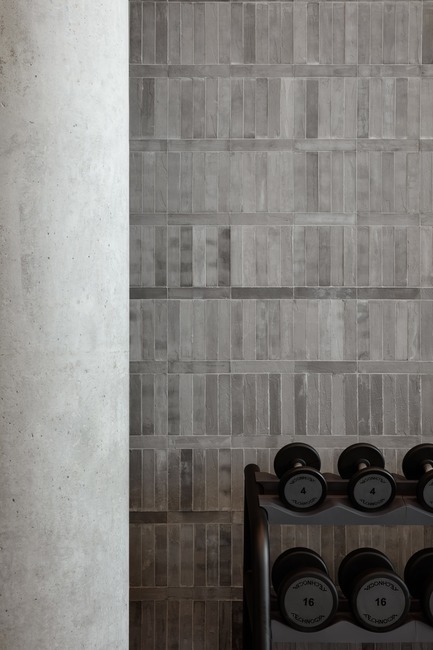 Inspired by brutalism in architecture and underground fight clubs, VSHD was determined to refrain from using the usual materials found in most health clubs. 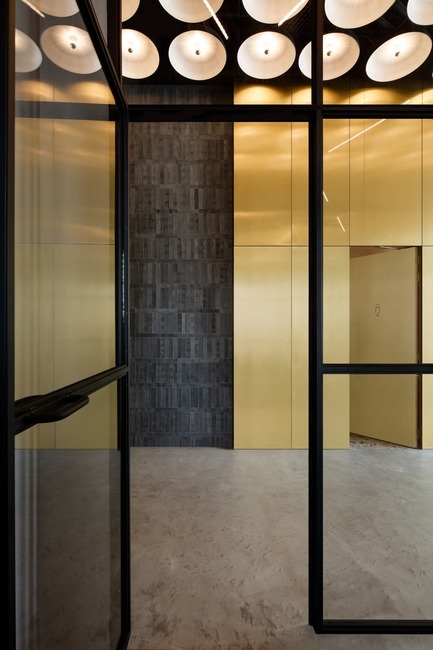 The architects used materials—not in the lexicon of modern—like concrete bricks combined with gold-copper alloy to make it look current, while at the same time creating modes that are elegant, warm and muscular. 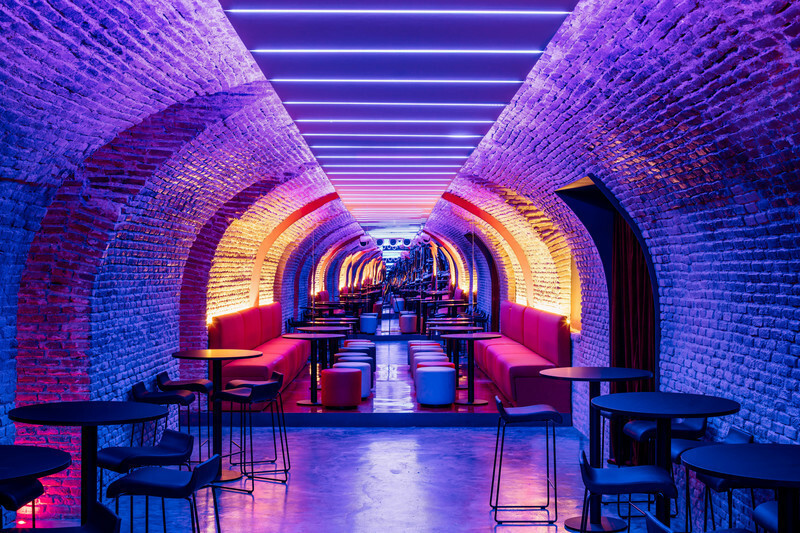 Specifically customized LED suspended light used to conceal all the ceiling services while maintaining an overall vibrant lighting mood that can be controlled by the different exercise zones. 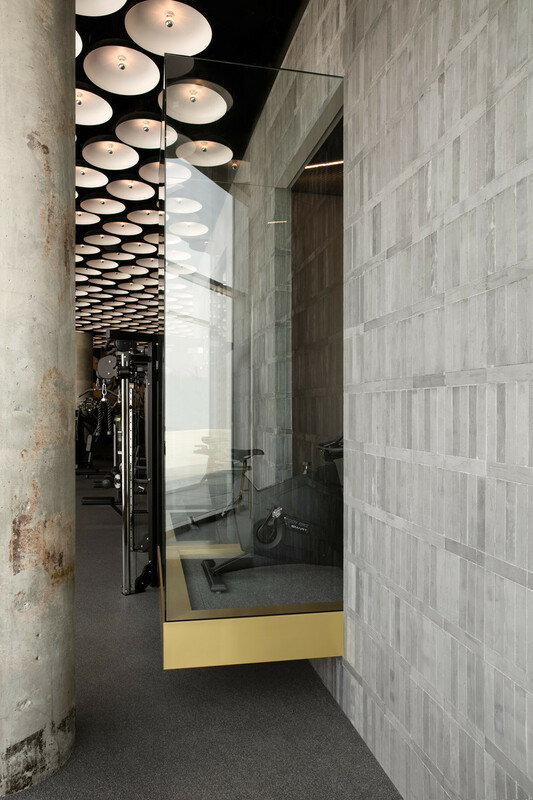 As the Warehouse Gym in D3 is located at the main entrance of the district with views from two main streets, it was essential that the design would capitalize on the view from the street to attract new members from the design-savvy community. 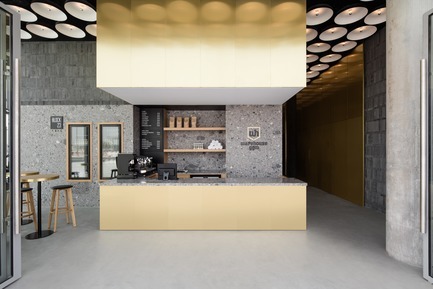 The reception/juice bar was designed as a communal space with a 17-meter-long glass façade on the main street creating a meeting point for the design community where they can meet after their daily workout or for non-members to stop by and grab a healthy smoothie or salad while experiencing the ambience of the gym. While the gym space was originally made up of three separate retail outlets which would have been rented out to 3 different commercial functions, we had to make sure that those spaces flow seamlessly in a very functional manner whereas every type of exercise has its own unique space while they are all still open onto one another to ensure that the different users enjoy the gym’s dynamism and vibrancy. 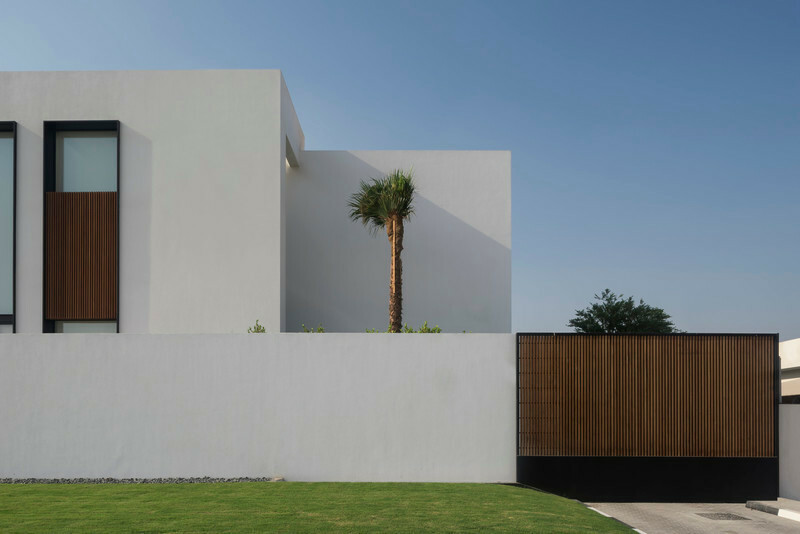 The semi-transparent cube in the center of the space can be combined with the gym floor to provide a large studio accommodating a larger number of users depending on the needs of any given day. 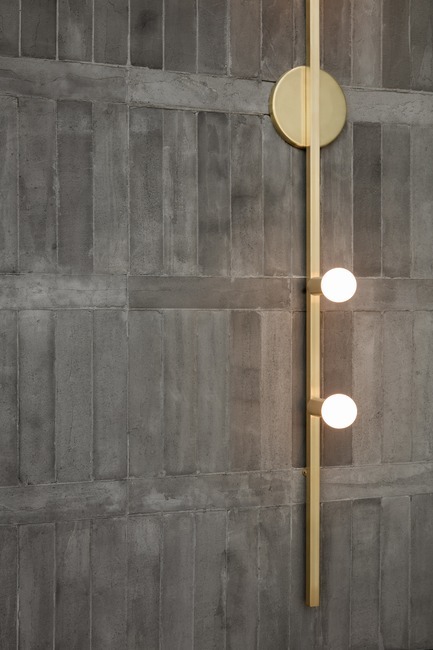 Materials used in the main gym floor and studios like the locally cured concrete bricks, gold-copper alloy and concrete flooring are very resilient to heavy use and develop an appealing patina that gives an authentic feel. 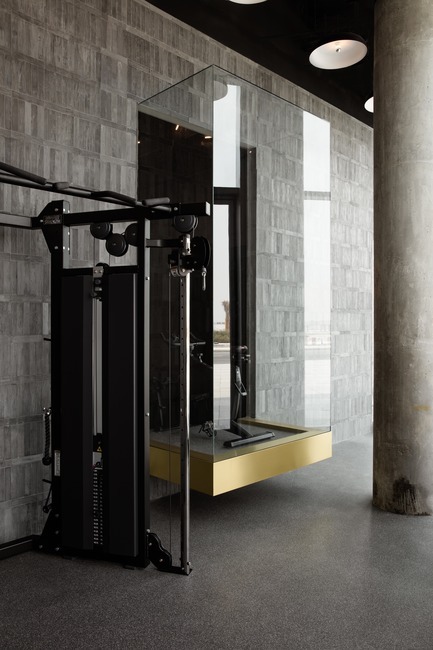 Suspended Cycling podium transfers the energy from the studio into the gym floor. 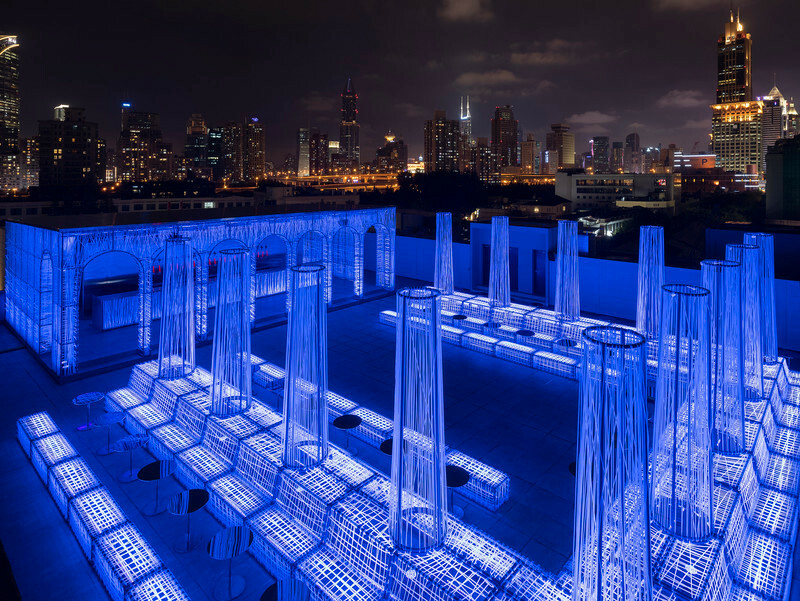 VSHD believes that as both, architects and interior architects, their role is to transform and repurpose the space and breathe new life into it. 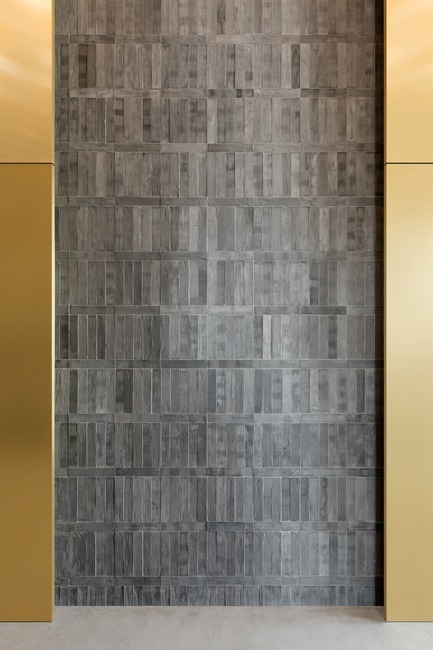 With each project, they combine modesty with elegance, to reach elements of calm, beauty and subtle luxury. 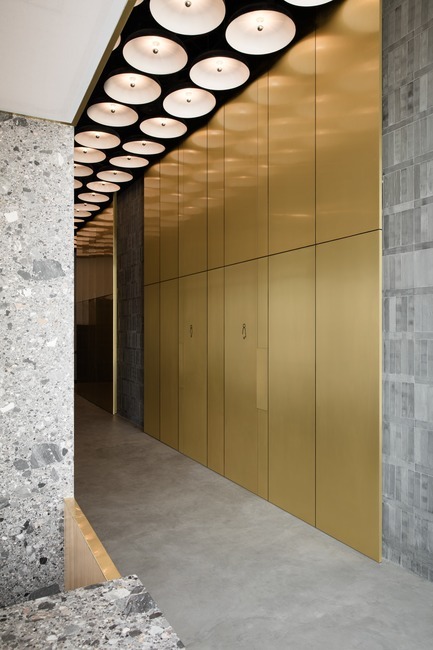 The main entrance to the gym with a juice bar and reception desk combined; highlighted by a custom made suspended light box in Gold Copper alloy. 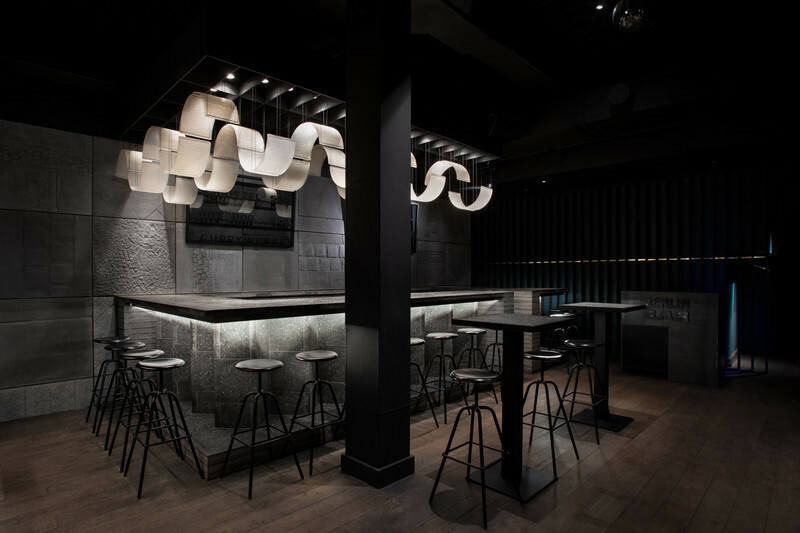 Side view into Juice bar, suspended LED ceiling lights designed to conceal all ceiling services. 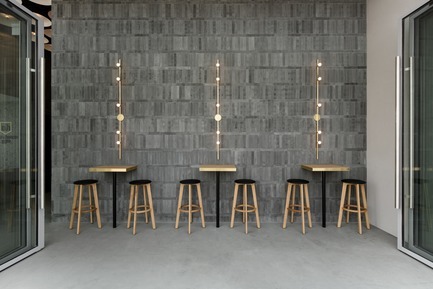 Suspended Cycling podium transfers the energy from the studio into the gym floor. 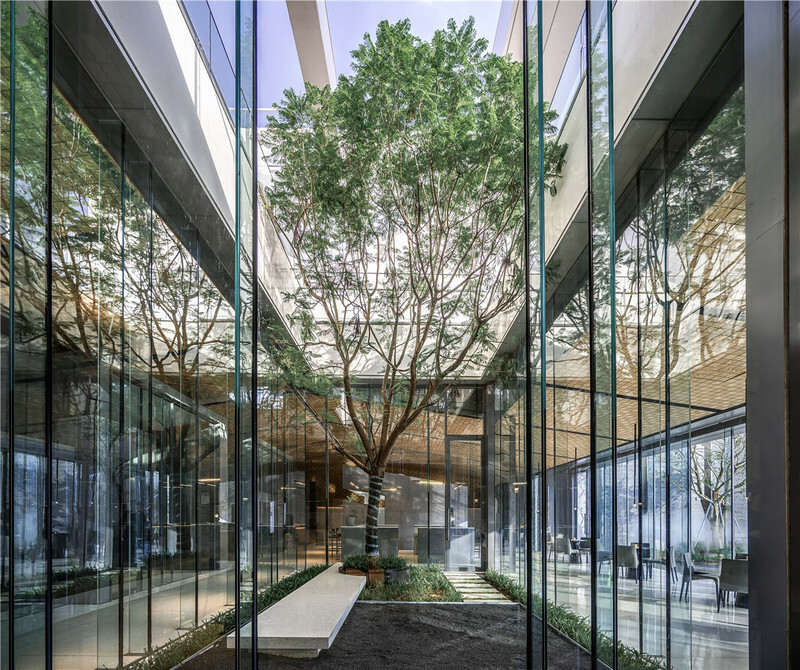 A communal space part of the 17m long glass façade, a space designed as a meeting point for D3 community with foldable doors that opens to an outdoor seating area. 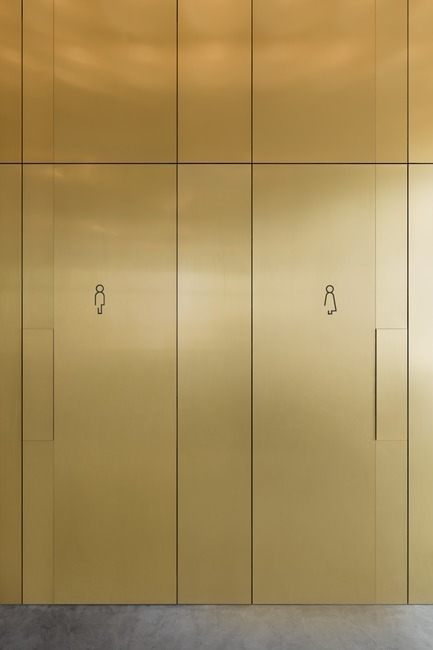 The main corridor cladded in gold copper alloy leading to the male and female changing rooms with concealed doors of the same material. 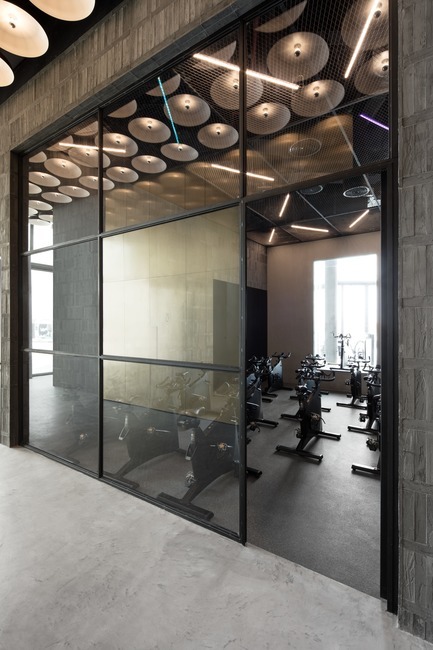 View into the cycling studio with ceiling lights creating a dynamic element throughout the gym. 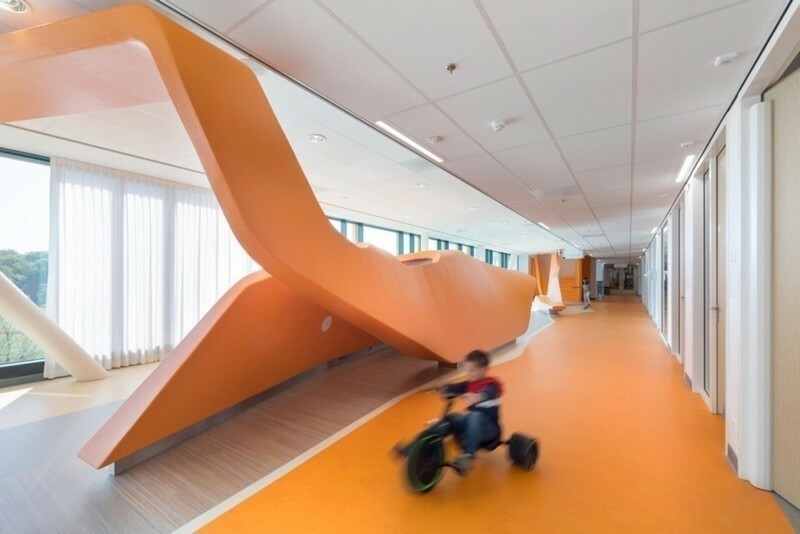 View from the cycling studio into the main corridor. 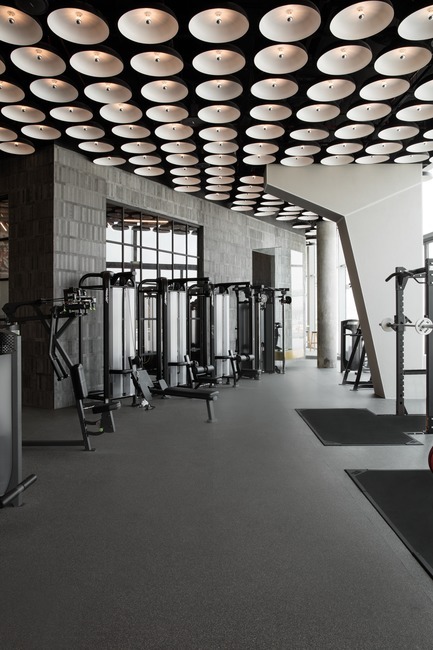 Main gym floor with customized suspended LED ceiling lights that can be controlled separately for each exercise zone. Suspended glass podium in the main gym floor. 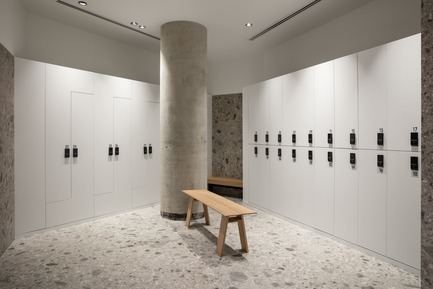 Details of circuit training studio with weight training zone. 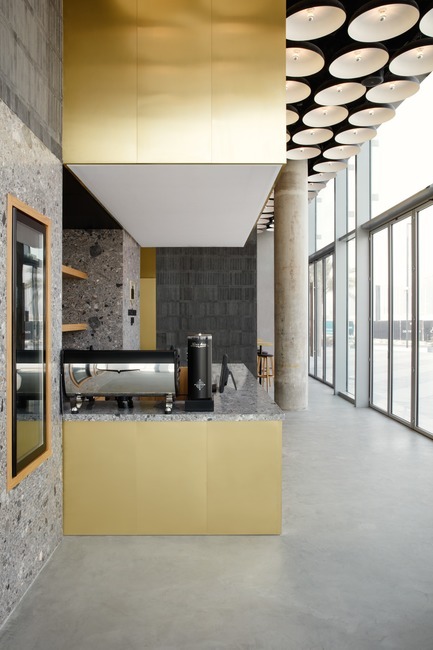 Locally cured concrete bricks, gold copper alloy and concrete flooring giving an authentic feel to the space and is resilient to heavy use. 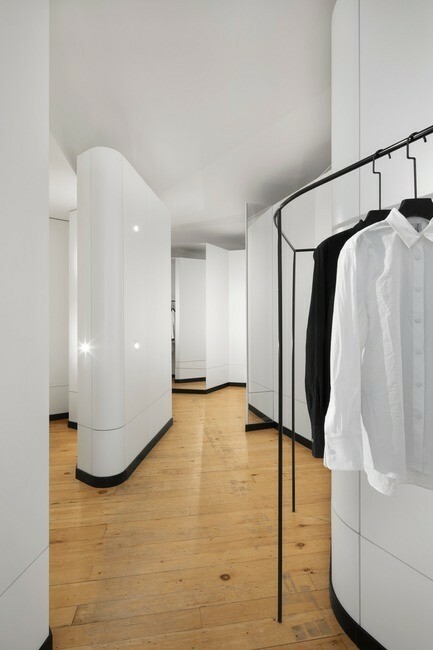 Male & Female changing room concealed doors. 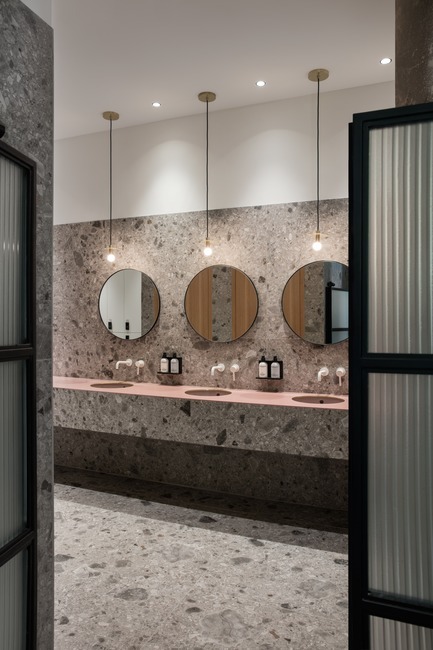 The wash area in the changing room with custom made mirrors and pink vanity. 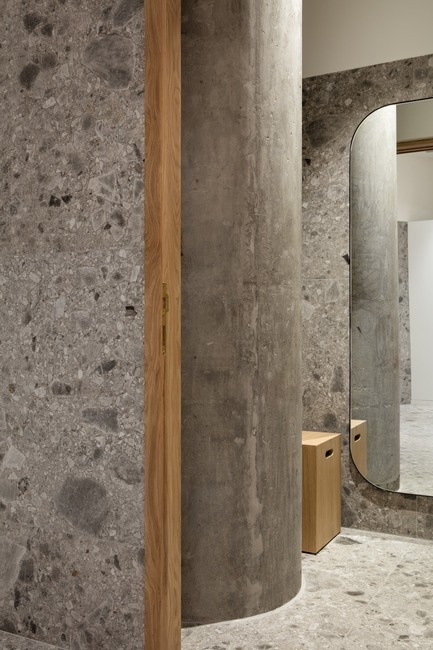 Changing room cubical with original structural column in raw concrete blending in with the tiles texture. 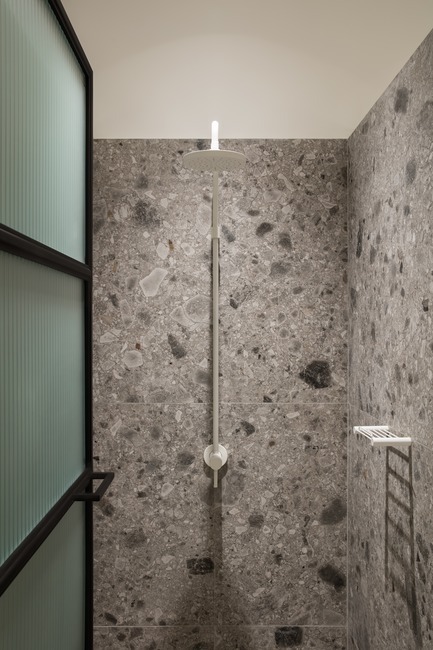 The shower cubical with customized ribbed glass doors.